Head-turning 2014 Toyota Tundra Limited Crew Max with the TRD Package, premium leather interior, heated front seats, power driver and front passenger seats, Navigation, back-up camera, AM/FM/CD/MP3 stereo with premium JBL audio, power rear cab window, tow-package, a clean Carfax, and 82k miles. This truck was priced at over $50k when it was new and is in excellent condition over-all. Check out the 90+ photos of this Tundra on our website at PuebloUsedCars.com. 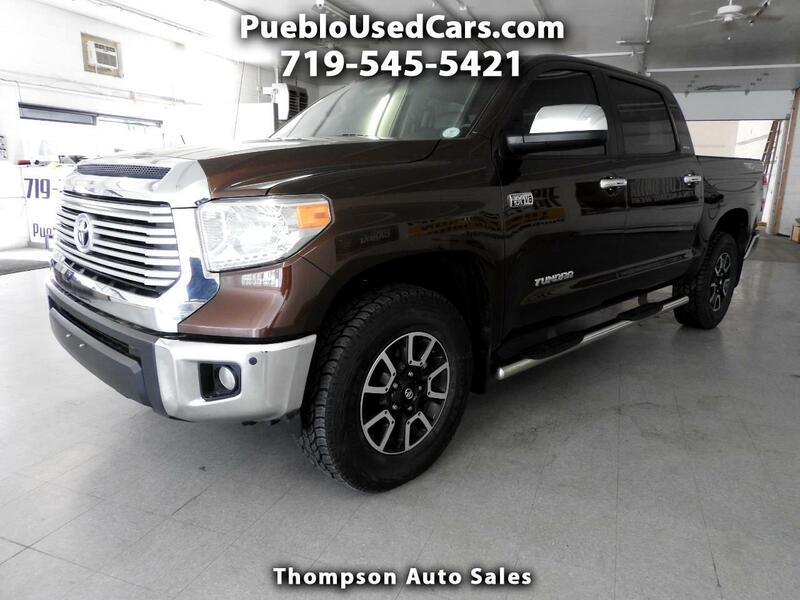 With Toyota reliability and build quality why not save yourself tens-of-thousands of dollars off the price of a new one on this incredibly clean 2014 Tundra Limited? The leather interior is spotless and all of the power options function perfectly. The Bronze exterior is sleek and make this Tundra a real head-turner. Under the hood the 5.7L i-Force V8 has power to spare and is smooth as silk. Inside and out this Tundra is in incredible shape and it looks, rides, and drives like it has far fewer than 82k miles. Check out the photos and then come see it in person at Thompson Auto Sales - 525 W 5th St in Pueblo, CO. This Tundra will not disappoint. Give us a call with any questions at 719-545-5421.